A large number of Chelsea fans are pretty convinced Alvaro Morata’s never getting back in the starting line up again after Olivier Giroud’s performance against Cardiff City today. 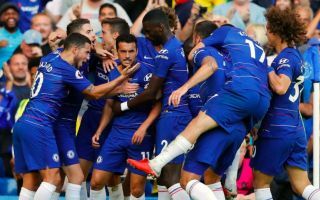 The France international has come in for a rare start for Chelsea today, and has clearly impressed these supporters after playing a part in giving the Blues a 2-1 first-half lead. Giroud has long been known for his superb link-up play as a target man, and looks a far better option for CFC than Morata ever has. The Spaniard has been a big disappointment since his transfer from Real Madrid last season, and has just one goal so far this season, offering little else on the pitch either. Giroud, meanwhile, has never been the most prolific, but has plenty of physical presence and intelligence to his play to get the best out of surrounding forward players and wingers like Eden Hazard, who has two goals this afternoon. Morata will never start again?????? Giroud with two assists in 45 minutes in his first start under Sarri. Far better than Morata. GIROUD AND HAZARD AGAIN! Two assist for Giroud to hazard. Morata BYE.